On Monday, I just happened to be catching up on some blog reading when I saw a post announcing the new "Core Curriculum" kit at NoelMignon.com. I usually like their kits, but often by the time I see them, they are sold out. Well, when I first saw Core Curriculum, it was love. 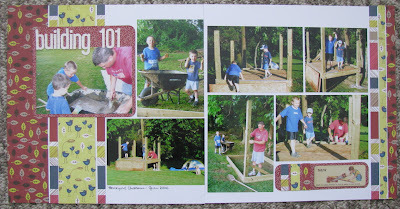 The kit had a school theme, although almost every sheet of patterned paper was double-sided. As an added bonus, the colors screamed "boy" to me. I noticed there were only 10 kits left, did a little figuring in my head and realized that even with shipping, I was getting a deal. My kit arrived on Friday and I am such a happy girl to have so many products in hand that aren't available locally. The papers are by Cosmo Cricket (Boyfriend), SEI (Play Day), American Crafts (Junior), Imaginisce (Teacher's), and Jillibean Soup (Alphabet Soup). The embellishments were just as wonderful as the papers. I received the Letterman Thickers I've been drooling over; Scenic Route rub-ons; Jenni Bowlin die cut paper, tickets, bingo cards, and mini alpha stickers; Melissa Frances chipboard flash cards, tags, and Tag & Envelope mini book; a Making Memories edge distresser, a Prima stamp; Jillibean Soup ribbon; Imaginisce paper flowers and large brads; an American Crafts red pen; an ink pad and several vintage items, too. There were a few items in the kit that would need specific photos to work with them. Since I want to use the whole kit (or as much as possible), I went through my photo boxes first. I knew the "sly fox" vintage playing card would be perfect with these shots of Kevin slipping in next to his crush as a basketball game. The photos are awful because I had to zoom my camera all the way across the gym and the gym lighting is terrible for photos. Still, I had to scrap this moment. The background paper is actually a free sheet of Creative Imaginations paper that I received as part of my free gift with my order. I mixed it with the Jillibean Soup and SEI (stripe) papers. I pulled the alphas from my stash - Thickers - and added some brads to accent the initial circles and here and there. Love this page! 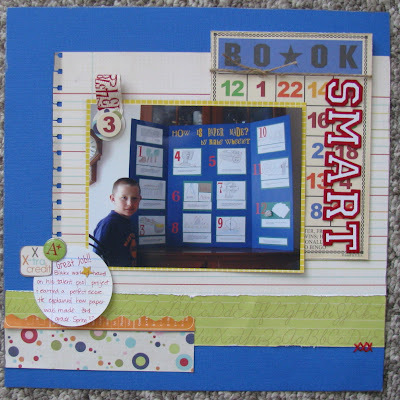 I had an idea to use the "book" Jenni Bowlin bingo card as part of my title - Book Smart. In my head the LO looked better than when I got it on paper. Blake liked it though and it is for his album. It shows off his Talent Pool research project from 3rd grade explaining how paper is made. I think if I just came across the Imaginisce papers in a store, I'd probably pass them off as being too "theme-y" or childish. I do love them though and am happy to have received them in the kit. I also love this page I made for Blake with his four teachers from last year. 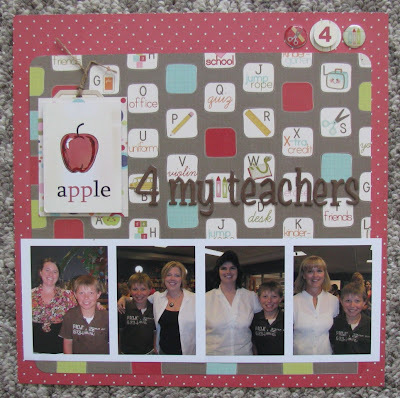 I loved the "apple" card and worked it into my title, too - apple 4 my teachers. I made a pocket behind the apple card for a tag to slip in with journaling about his teachers and the subjects they taught. The Thickers were a brand new purchase (and a new favorite font of mine). I took the papers that were actually my least favorite and put them to work here with these pics from 2006. I also used an Allison Davis sketch. I was even able to add the darling little Melissa Frances chipboard "saw" tag. I used vinyl Thickers from my stash for the title. With 19 sheets of patterned paper, I think I will have plenty more layouts to share using this kit! Love what you did with the kit. So happy for you that you finally got those Thickers! Great pages. I love the one with Kevin "slipping" next to his crush!! Great page!